Oscar Winner Sandra Bullock and Oscar Nominee Melissa McCarthy team up in this outrageously funny comedy from the director of Bridesmaids, Paul Feig. Uptight FBI Special Agent Sarah Ashburn (Bullock) and foul-mouthed Boston cop Shannon Mullins (McCarthy) couldn't be more incompatible. But when they join forces to bring down a ruthless drug lord, they become the last thing anyone expected ... buddies. $39.115 million on 3181 screens. Up until 2011, Paul Feig threatened to be remembered as “that Freaks and Geeks guy” or “Judd Apatow’s pal”. Then he directed Bridesmaids, an enormously successful comedy, and changed all that. The popularity of Bridesmaids meant Feig’s follow-up would come with high expectations, and to his credit, he managed to live up to them. 2013’s The Heat didn’t do quite as well as its predecessor, but it came close and showed that Feig wouldn’t be a one-trick pony. As an old Freaks and Geeks fan, it’s nice to see Feig do well, and it’s even nicer to report that he continues to create entertaining movies. In The Heat, we meet FBI Agent Sarah Ashburn (Sandra Bullock), a highly-competent worker whose smarmy sense of superiority rubs her colleagues the wrong way. On the hunt for a promotion, Ashburn heads to Boston to pursue leads that will hopefully let her apprehend a notorious drug lord. When Ashburn gets to Beantown, she encounters unexpected trouble via Detective Shannon Mullins (Melissa McCarthy), a local cop working some of the same connections. Loud, sloppy and unruly, Mullins provides the polar opposite to the meticulous, buttoned-down Ashburn, and they immediately clash. However, stuck together, they need to learn how to work together if they plan to finish the case – and stay alive. Going into The Heat, I didn’t expect much, largely due to its trailer. That’s not because the promo lacked amusement; it actually showed some funny bits. Instead, it’s because I saw that trailer over… and over… and over. 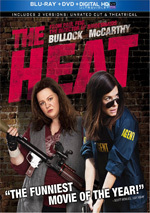 The Heat was originally supposed to come out in the spring of 2013, but the studio postponed it to the summer so it wouldn’t directly compete with Identity Thief, another McCarthy vehicle. This decision came late in the game, which means trailers for The Heat began to run very early in 2013 and they continued to play up until the movie’s June release. With a good five months of screenings, I must’ve seen that ad at least 20 times – and it was always the same one. Most films provide a variety of promos, but in the case of The Heat, that never occurred; the trailers remained identical from beginning to end. By June, I could act out the entire thing. Why did this make me fear The Heat would be a dud? After all, a trailer accounts for only a brief portion of the flick; surely it’d muster levity in its remaining 115 minutes, right? In theory, yes, but movie comedies come with a history of “front-loaded trailers”. Studios pack in all the funny bits, so when we see the final product, too often we discover that we’ve already seen all the humor they have to offer. Happily, that doesn’t occur here; even if we drop those trailer moments that I saw umpty-ump times, The Heat comes with many, many funny elements. Heck, it even manages to deliver some amusement from the sequences in the ads because it turns out the trailer didn’t use the final takes. The promo provided alternate versions of those moments; even though the end product comes with similar bits, they’re not identical, so they boast some freshness for those of us who’d rather eat a bug that watch that stinking trailer again. Does The Heat manage to provide anything new? No – it takes on basic “buddy cop” territory, with the expected emphasis on how Mullins and Ashburn conflict with each other and then learn to become a team. It’s basic Odd Couple material as well as action/police components; the film leans toward a parody of these and has a lot of fun with the genre. While The Heat may lack innovation, it compensates with basic comedic sizzle. I won’t call it non-stop laughs, but it comes closer than most movies and comes with quite a few amusing moments along the way. It develops its characters just well enough to get us to invest in them but it allows them to focus on the comedy in a positive manner. Excellent chemistry between Bullock and McCarthy helps. We normally think of Bullock more as a light romantic-comedy sort, not someone for a profane, broad piece like this, but she more than carries her own. She melds with McCarthy – a more typical participant in a flick like this – to create a fun, delightful team. Like the flicks associated with Feig’s pal Apatow, The Heat probably runs too long; 117 minutes doesn’t seem like an endurance test, but I think it could’ve lost 10 to 15 minutes and been a tighter experience. That said, it still keeps us pretty entertained from start to finish. The Heat brings us a wild, funny comedy. The Heat appears in an aspect ratio of approximately 2.40:1 on this Blu-ray Disc. Though not stellar, the transfer mostly satisfied. Sharpness was usually fine. A few wide shots tended to be a bit on the soft side, but those examples didn’t dominate. Instead, the majority of the film provided good clarity and accuracy. I saw no jagged edges or moiré effects, and edge haloes failed to appear. Print flaws remained absent in this clean presentation. With its stylized palette, The Heat veered toward a moderate teal feel. That was the main tone, though some other colors popped up as well. Despite the restricted hues, the colors seemed pretty well-rendered. Blacks looked dark and firm, and low-light shots displayed nice clarity. The image could’ve been better, but it was still a solid “B+”. Despite its action orientation, the film’s DTS-HD MA 5.1 soundtrack doesn’t provide a ton of pizzazz. Music became the most involving element, as songs/score fleshed out the five channels. As for effects, they occasionally turned into involving partners via components like explosions and gunfire, but they had less to do than I might expect from a cop story. Audio quality was strong. Speech always came across as distinctive and crisp, without edginess or other concerns. Music sounded peppy and full, while effects appeared accurate and dynamic. I would’ve liked a bit more use of the surrounds but I thought the track remained more than acceptable. The Blu-ray comes packed with extras, and we find both the theatrical (1:57:04) and unrated (2:00:20) cuts of the film. The added three minutes, 16 seconds brings us a mix of fairly minor clips. We get a few more laughs but not anything that notably changes the movie. Nonetheless, I like the option to see the slightly elongated cut. The disc delivers four – that’s right, four - audio commentaries. Alongside the unrated cut, the first features director Paul Feig, as he offers a running, screen-specific look at the project’s roots and his involvement, story/character areas, editing and changes made for the longer version of the film, cast and performances, music, sets and locations, stunts and action, various effects, and a smattering of other areas. Bright and funny, Feig rarely takes a breath during this fast-paced track. He fills every moment with useful details or humor and gives us a piece that keeps us entertained from start to finish. This turns into a simply terrific commentary. The remaining chats accompany the “R”-rated edition of the film. The first of those comes from Feig, screenwriter Katie Dippold, producer Jessie Henderson and actors Melissa McCarthy, Mike McDonald, and Adam Ray. All of them sit together for a running, screen-specific piece. We get notes about cast and performances, characters and editing, sets and locations, and general experiences during the shoot. After the highs of Feig’s solo track, this one suffers from a pretty severe drop-off in quality. A smattering of informative tidbits emerge, but we mostly get a lot of laughing, joking and praise. The commentary still delivers some decent moments but it’s not an especially useful chat. For Commentary Three, we hear from Feig and “the Mullins family”. This means we get the director along with actors Jessica Chaffin, Jamie Denbo, Jane Curtin and Michael Tucci, except the four actors (usually) remain in character. Feig plays the straight man while the “Mullins family” discusses what they see on screen. In-character commentaries are a dicey proposition, but this one’s fairly entertaining. Denbo and Chaffin do most of the heavy lifting here; Tucci and Curtain chime in reasonably frequently, but the younger ladies carry the show. Though the participants slip out of character in confusing ways at times – for instance, they refer to Shannon Mullins as a real person on screen but also talk about Melissa McCarthy’s performance – this is still a pretty fun and entertaining piece. Finally, we get a commentary from the original line-up of Mystery Science Theater 3000. They give us the usual deadpan mockery of what they see, and it’s not especially enjoyable. I think the MST3K framework only fits bad movies; attempts to make fun of something good feel forced and don’t fly. That’s the case here. To be sure, The Heat isn’t a classic beyond reproach, and the participants score some occasional points. However, mostly they throw out tepid half-insults and bad puns. This turns into a slow, tedious chat. Another alternate audio track lets us “attend” the film’s Ziegfeld Theater Premiere. This presents the movie via a Dolby Digital Stereo mix and allows us to hear how the audience at the premiere reacted. Maybe someone will enjoy this option, but I think it’s a waste of time. Welcome to the Bonus Features! offers a 27-second intro from Feig. Seated by a fireplace, he greets us, farts and lights a match. It’s actually kind of funny. Under Mullins Family Fun, we find a nine-minute, 20-second reel. We get alternate lines from various actors, with an emphasis on Chaffin and Denbo. Not all of them work, but plenty of them amuse and make this a fun collection. Similar material shows up under the eight-minute, 28-second Acting Master Class. It delivers more outtakes/alternate lines, this time was a focus on McCarthy and Sandra Bullock as they go through a bonding scene. It’s not as funny as “Mullins”, but it still gives us an interesting look at the shooting of the sequence. Hey look – more outtakes appear with Let’s Get Physical. It fills six minutes, 31 seconds and offers additional glimpses of the movie’s “hands on” comedic bits. I prefer the alternate lines, but this batch of shots still comes with some entertaining moments. Next comes the six-minute, 43-second Police Brutality, more outtakes pop up and focus on Mullins scenes. Deemed “too mean” for the final cut, we see McCarthy verbally and physically abuse a variety of participants. It’s another amusing conglomeration. Do you want more outtakes? Then head to Von Bloopers, where we locate 15 minutes, 41 seconds of goofs and giggles. Some line variations appear, but this is mostly a standard blooper reel, so it’s not as much fun as the other collections. Still more alternate material shows up with Supporting Cast Cavalcade. It goes for seven minutes, 44 seconds and gives us a bunch of additional unused line readings. These continue to entertain. Feig wraps things up with Over and Out. He gives us a 36-second “outro” that echoes the earlier intro. It’s inconsequential but amusing. Plenty of cut footage shows up within All the Stuff We Had to Take Out But Still Think Is Funny. This breaks into three areas: “Deleted Scenes” (11 segments, 10:12), “Extended Scenes” (12, 14:45) and “Alternate Scenes” (4, 3:41). Most of the interesting information shows up in the “Deleted Scenes”; we get more with Rojas, and we see our leads do more detective work. These don’t offer huge changes, but they add some useful and amusing footage. As for the others, they’re also fun but not as vital. The “Extended” and “Alternate” scenes manage to keep us entertained, but they don’t do much to change the existing sequences. They’re enjoyable, though. Finally, we locate a featurette called How The Heat Was Made. This fills 19 minutes, 44 seconds and gives us comments from Feig, McCarthy, Dippold, Chaffin, Curtin, Denbo, McDonald, production designer Jefferson Sage, and actors Sandra Bullock, Tony Hale, Bill Burr, and Spoken Reasons. We learn about cast and performances, script/characters, production design and shooting in Boston, dance and action sequences, and related elements. The content tends to be fluffy and promotional, but we get some good behind the scenes shots; those make “Made” worth a look. The disc opens with ads for The Way Way Back and The Internship. No trailer for The Heat shows up here, but if you’d like me to act it out for you, feel free to drop me a line! A second platter provides a DVD copy of The Heat. It includes none of the Blu-ray’s extras. The Heat has fun with “buddy cop” conventions and delivers a winning comedy. Most of the gags it throws at the wall stick, and the chemistry between its leads helps carry the day. The Blu-ray offers pretty good picture and audio along with a long roster of usually enjoyable bonus materials. A consistently amusing comedy that stands up to repeated viewings, The Heat gets my recommendation.